I love taking ordinary photos and turning them into beautiful works of art for your home or office. I can use your photos or ones I have taken to custom "paint" them so they will look like an oil painting. I use Photoshop to hand brush every pixel of your photo and then add textures, colors, edges, etc. to transform your photo into a one-of-a-kind canvas wrap or archival print mounted and ready to be framed. Please contact me at 636-328-6784 or cpi_photos@yahoo.com to discuss what you are wanting me to create for you! 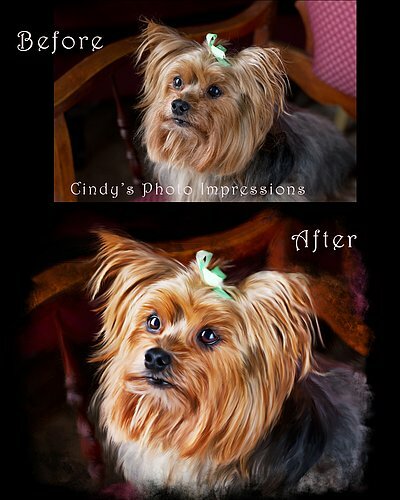 When I mentioned to Cindy Wiltse (of Cindy's Photo Impressions) that my dog Danny did not like to ride in the car, Cindy said not a problem and photographed Danny in our home where he was relaxed and comfortable. The painting of him she created from this photo was outstanding. He is a senior dog and I know this portrait will be a lasting treasure.. M. T.